The man behind this citation is one of the kindest, friendliest, most polite, modest, composed, dedicated, intelligent and down-to-earth persons that I have ever met, and I am extremely honored to know him personally. He dresses like an old-fashioned dandy which suits him to a T, he possesses an immense (read: enviable) knowledge of the history of cinema and on top of that, he is a brilliant, uncompromising Artist with great understanding of film. Oh, and he's pretty real, even though our hanging out together for about a day and a half feels like a dream now. When I think about it, it is almost as if he is able to blur the boundaries between fiction and documentary both in cinematic and our reality. Maybe there is some sort of magic in the way he speaks or strokes his trademark mustache? My words may sound subjective and über-panegyrical, but they are a sincere expression of gratitude for the abovementioned dream which was the deepest and most tangible on the 5th of April. 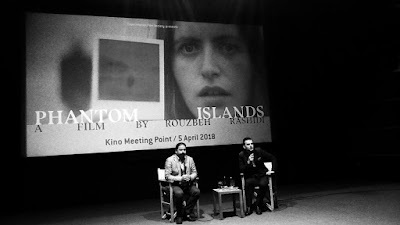 That day, the screening of Rouzbeh Rashidi's latest opus - a prog-masterpiece called Phantom Islands - took place in Sarajevo, at the wonderful venue of Kino Meeting Point, so many kudos and regards to Zulfikar Filandra who organized and hosted the event. The consuming experience of seeing the film - in all of its 4K + special lenses glory - for the second time and on the big screen made me want to write a bit more about it. On the superficial level, this genre-defying piece operates as a neat collection of homages and references, not only to the trio of directors it's dedicated to (Epstein, Duras & Żuławski), but to other auteurs as well, such as Ruiz, Bergman and Tarkovsky. Opening with the quote from Sheridan Le Fanu's novel The Tenants of Malory (... and saw the island rising in the distant sheen, white and filmy; a phantom island...) followed by the goosebump-inducing scene of thundering skies (that are gorgeously color-graded by Michael Higgins, a filmmaker in his own right), it tricks you into thinking that what you are about to see is a horror movie. However, it is not - much like the ouroboros, it consumes itself by documenting the fiction and simultaneously fictionalizing what has been documented, and enigmatizing its own self-reflexivity. Surprisingly, Rashidi invites the audience to join him on his pursuit for answers to the questions regarding their relation to film and non-film, time and space, reality and fantasy, others and ourselves, conscious and subconscious, etc. And although a large portion of his invitation is written in inscrutable signs that even the protagonists find difficult to read (if the occasional confusion on their faces is any indication), there is something very humane about those 'alien' symbols. Besides, they stir up a gamut of thoughts colliding, intertwining and overlapping long after the final frame (of the infinite horizon bathed in dying light). Mostly shot in soft focus à la Sokurov or rather, the 19th century photography, the titular islands float in a dialogue-free limbo where the proceedings are almost never laid out in chronological order. Muted as in the best tradition of silent cinema, the two leading characters - portrayed by Clara Pais and Daniel Fawcett who channel the spirits of Marguerite Gance and Jean Debucourt, respectively - are co-starred by animals and 'local ghosts' or could be ghosts themselves. The conflict between their beautifully choreographed performance and the sublime naturalness of the surroundings puts an emphasis on the film's Rebis-like constitution. 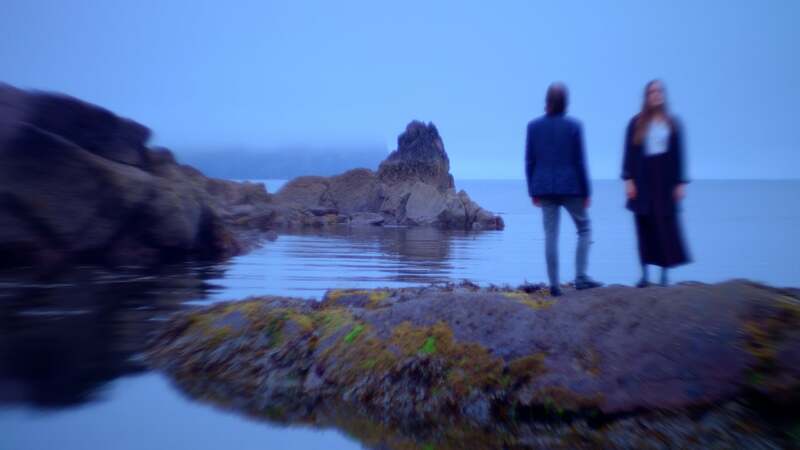 They seem to be the embodiments of dichotomous ideas mirrored in the incongruous, yet unforgettable pairing of aural and pictorial narratives.